Copper was used for jewellery and decoration for perhaps millennia before it was first used for weaponry in the late 5th millennium BC. The first copper weapons were axes and spear and arrow heads. 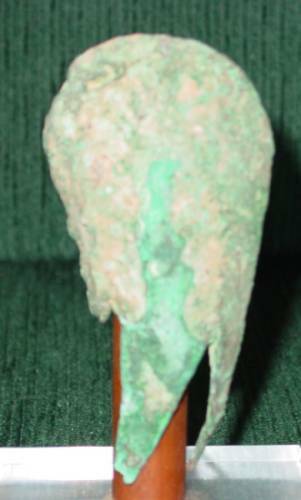 Copper mace heads begin to appear in the area of modern-day Israel circa 3000 BC and Iran, by 2400 BC at least. The first copper maces were round and were clearly imitations of stone mace heads. Copper had the added advantage of being a prestige item - a metal weapon was a clear sign of wealth and power. 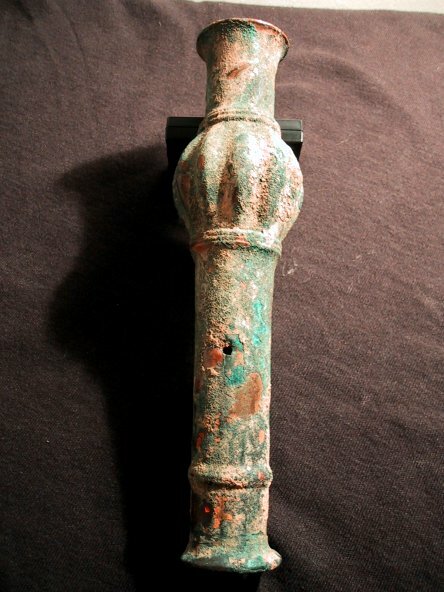 This explains why copper mace heads were often found in large hoards such as at Nahal Mishmar near the Dead Sea. Very soon, copper mace heads began to be cast in a wide variety of complex forms. The lost-wax casting method, once mastered, allowed for very complex shapes to be cast. The Nahal Mishmar hoard, circa 3000 BC (?) 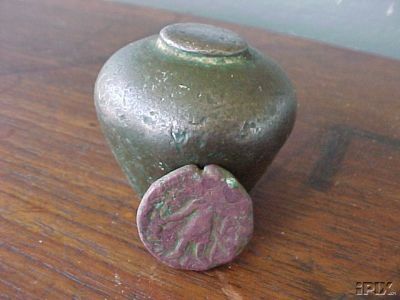 contained some mace heads of very complicated forms long thought not to have originated until several millennia later. Through the 3rd Millennium BC copper mace use spread eastwards through Mesopotamia, Iran and Bactria (modern day Afghanistan and Turkmenistan). Interestingly, metal maces did not spread everywhere. They did not are unknown in Dynastic Egypt. They did not replace stone maces in Europe where copper axes seem to have dominated instead. Maces were completely unknown in ancient Greece and Rome. 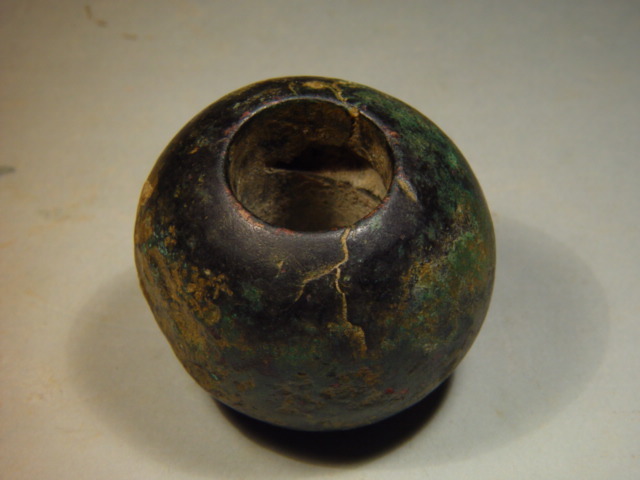 This mace head originates in Western Syria. While it was reported to date from c.1200 BC recent evidence has shown that very similar mace heads thought to date from the same era actually date from the early 3rd millennia BC (c.3000-2500 BC). These similar maces were found at Tell Abu Matar and Nahal Mishmar in Israel and are considered to be from local Chalcolithic cultures and not from later Canaanites or Hittites as previously thought. 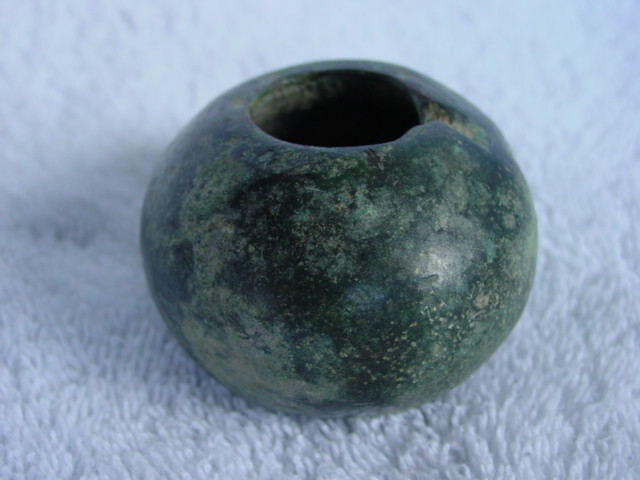 This mace is a slightly flattened sphere 6cm in diameter and 4.45cm high. The hole is 2.55cm (bottom) and 2.45cm (top) in diameter. It is hollow cast and is roughly 3-4mm thick at the edges. It is quite heavy at 0.40kg (0.88 lbs). It is made of copper. 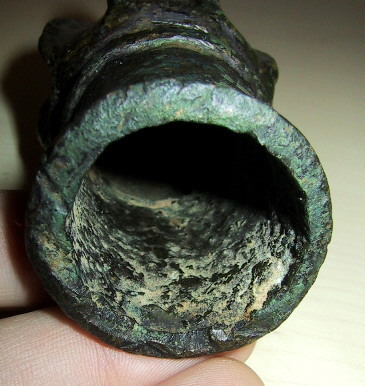 Lower view showing the hollow interior of the mace head and the uneven and slightly crude rim. This mace head also originates in Western Syria. It too was reported to be Canaanite or Hittite and date from c.1000 BC but may actually be from the Chalcolithic era and date from the early 3rd millennia BC (c.3000-2500 BC). This small mace is only 3.94cm in diameter and 3.33cm high. The hole tapers slightly from 1.55cm (bottom) to 1.3cm (top) in diameter. It is of solid construction, not hollow, and is quite heavy for its size. It weighs 0.20kg (0.44 lbs) - the same as the much larger Egyptian piriform stone mace head shown on the previous web page. It is made of copper. This mace has suffered extreme stress resulting in deformation and cracking. It is impossible to say if this was due to a great blow in antiquity or stress and pressure while buried for between three and five millennia. 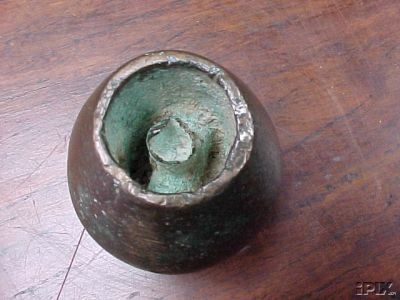 Top view of the mace head. The stress fracture is evident as is the solid construction. A small amount of the verdigris has worn off the edge of the haft hole showing the copper underneath. The narrow haft is like those in pre-dynastic Egyptian and early Dynastic Mesopotamian stone mace heads. This mace is of a uniquely Bactrian form. It is a hollow oval with four long �claws� on the bottom. The claws were presumably tightened onto a wooden haft. These maces are usually found bent with one or more claws missing. They appear to have been struck off their haft and do not appear to be a very effective construction explaining why the design did not spread beyond Bactria. The construction of these maces is quite simple and they may be very early. Sarianidi dates them to the 2100 to 1600 BC era. 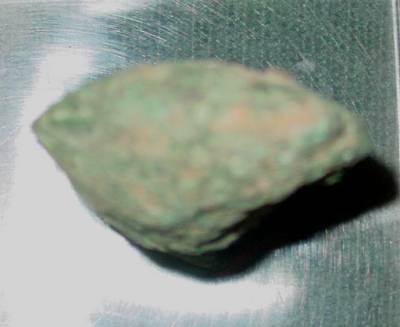 This example is covered in a hard green-blue patina with sand and stone bits incorporated. There are some traces of wood on the inner patina. The mace is 11.1 cm high, 5.2 cm wide and 2.8 cm thick. The claws were 5.0 cm long and tapered from 2.2 cm wide. The metal is roughly 2.5 mm thick. The mace head weighs 0.14 kg (0.3 lbs). It is made of copper or bronze. 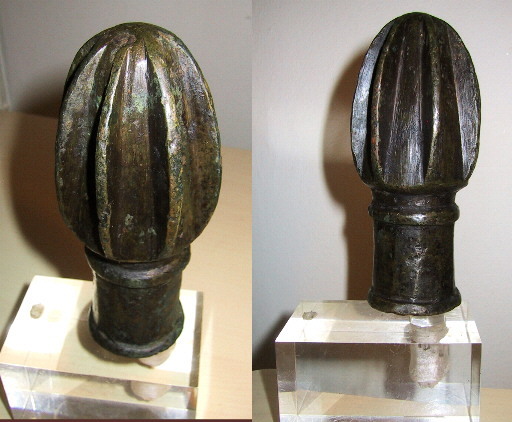 This bronze piriform mace head is very solid and is quite heavy for its size. The mace head is Bactrian but its age is in question. It is shown with a coin which it was said to be found with. The coin is readily identifiable. It is a coin of the Kushan king Vasu Deva I who ruled Afghanistan circa 192 to 225 AD. However, the mace head is likely much earlier. An view of the inside of the shaft shows a �T-shaped� tubular cross-bar which helped attach the mace head to the haft. Sarianidi, in his Kunst des alten Afghanistan, dates this type of cross-bar to the 2100-1600 BC era, the same era as the simpler oval-claw mace shown above. The mace head is 4.4 cm in diameter and 4.0 cm high. The haft hole is 2.05 cm in diameter and around 3.4 cm deep. It weighs 0.24 kg (0.5 lbs). A mace in one of the most well known Luristan styles. Luristan is a region in the central Zagros mountains in Eastern Iran well known for its early artistic bronzes. However, the full history of the region is little known and many so-called Luristan items actually originate in a wider area of Eastern Iran and neighbouring regions. 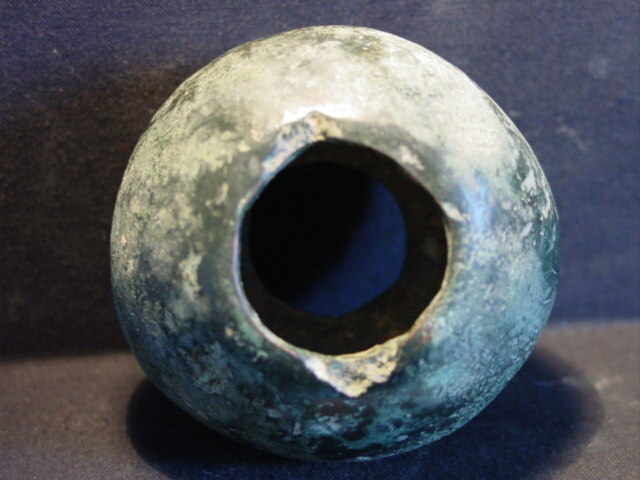 This one piece mace head is a long cylinder with a bulbous head near the top. The head has twelve segments or proto-flanges. The mace is decorated with three sets of three narrow rings. The cylinder flares wide at the top and bottom openings. The bottom flare is oval and not round in order to accommodate a small (5.5 x 2.0 mm) rectangular hole in the base. The purpose of this hole is not known although it may be for a colourful ribbon or a leather strap or binding. There is also a 3mm diameter hole in the cylinder for a securing pin. 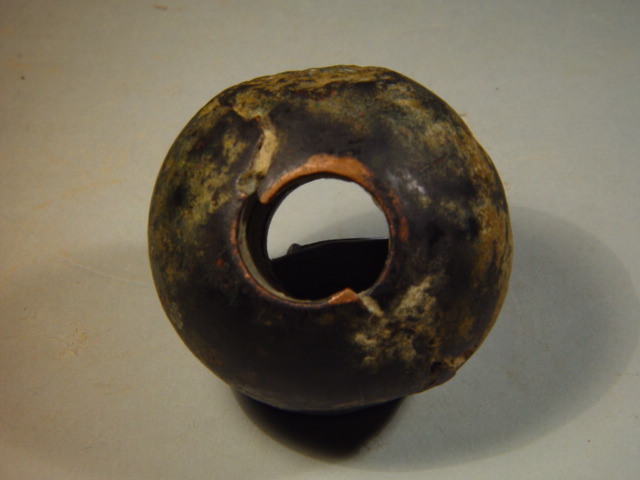 This mace head was found in the Luristan area of Iran circa 1962-63 by a Danish engineer working with the Danish road building firm Kampsax Ltd. On the Susian link of the Great Khorasan highway. This exact type of mace is dated in Moorey�s Ancient Persian Bronzes in the Ashmolean Museum, plates 92 and 93, to circa 1200-800 BC. The mace is 17.4 cm long. The rounded head is 4.4 cm in diameter and 4.5 cm long. The cylinder is 2.35 cm in diameter flaring to 3.3 cm at the top and bottom. It weighs 0.32 kg (0.7 lbs) and is made of bronze. The identification of this ancient Iranian mace head is less certain. It was found somewhere near northeastern Iran but I have been unable to find any documented parallel. While bronze maces were used in this area, as well as neighbouring Bactria and Luristan, as early as the late 3rd millennium BC, it is very unlikely that this mace is from that era. It likely dates contemporary with the later, or second era, Luristan maces, circa 1200-700 BC. However, it is even possible that this is a true Persian mace. There are references in Persian literature to Acheamenid maces from the 5th century BC and Sassanian maces from the 5th century AD. The mace is a rare ancient flanged mace. It is oval in form with 8 flanges. The lower cylindrical portion is actually twelve-sided and not round. The mace is very well crafted. The mace is 11.7 cm tall and 5.5 cm in maximum diameter. The flanges are 6.3 cm long, 0.8 cm high and 3.5 to 4.5 mm thick. The cylindrical shaft is 3.4 cm in diameter, widening to 3.95 cm at the base. The haft hole is 2.95 cm in diameter. It weighs 0.36 kg (0.8 lbs) and is made of bronze.